In the fifth year since its inception, I think OnePlus has a certain urge for professionalism. In different European countries there are dedicated country representatives. If you search deeper on networks like Linkedin or Xing, you can even see this from open positions, such as Senior Technical Account Manager, whose job description includes being in close contact with network operators to promote features like VoWiFi and VoLTE in certain countries. Especially in Germany and certainly in other countries outside of Europe, OnePlus must push forward with the classic distribution of smartphones in order to achieve steady growth. But I digress, we will certainly report on OnePlus and its long-term goals in more detail in the full review. When is the OnePlus 6T available and how much will it cost? Back to the actual smartphone and one of the most important pieces of information for the die-hard OnePlus fans – price and availability. Starting November 1st in the US and November 6th in Europe, the OnePlus 6T will officially be available on the manufacturer’s website and will be available in two color variants (Midnight Black and Mirror Black) with three memory configurations. The price has increased slightly compared to the predecessor model without the T-addition. The prices are as follows: $549 for the 6/128 GB version, $579 for the 8/128 GB and $629 for the 8/256 GB. 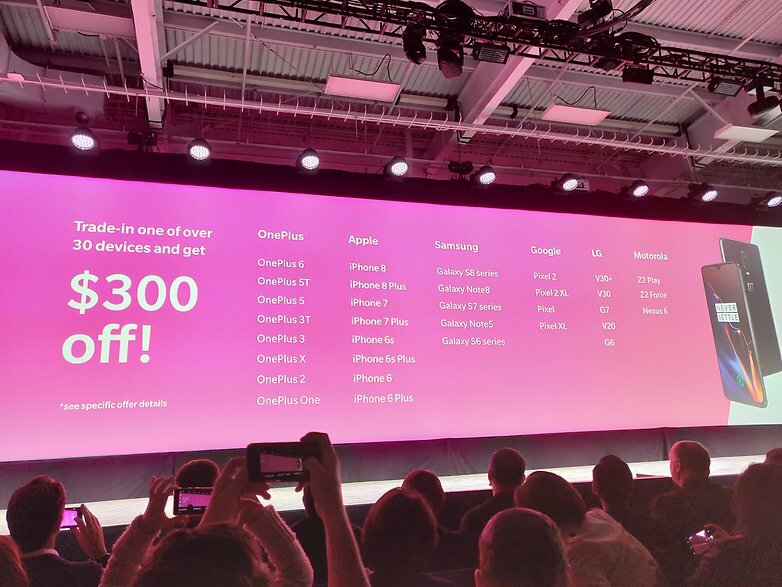 OnePlus also officially announced a partnership with T-Mobile during the event. From November 1st, the OnePlus 6T will be available in more than 5600 stores across the US. T-Mobile is offering a trade-in offer with which can get you up to $300 off. You can see the full list of compatible devices below. At first glance, it seems that OnePlus made only minimal changes to the 6T. The notch has become smaller, the fingerprint sensor has disappeared from the back and has been integrated into the display, and the headphone jack – still desired by some, has been completely removed. In terms of technical specifications, it looks like OnePlus has retained almost everything from the 6, except for a larger battery, which is up to 3,700mAh. As small as these changes may seem at first glance, they are quite effective in everyday life. For example, the fingerprint sensor in the display. The old placement of the fingerprint sensor was practical as soon as you picked it up, but if you have the smartphone next to you on your desk while you work, it’s impractical. Sure, some would say that you should just use Face Unlock, but you would have to lean forward above the lying smartphone. Not exactly practical. 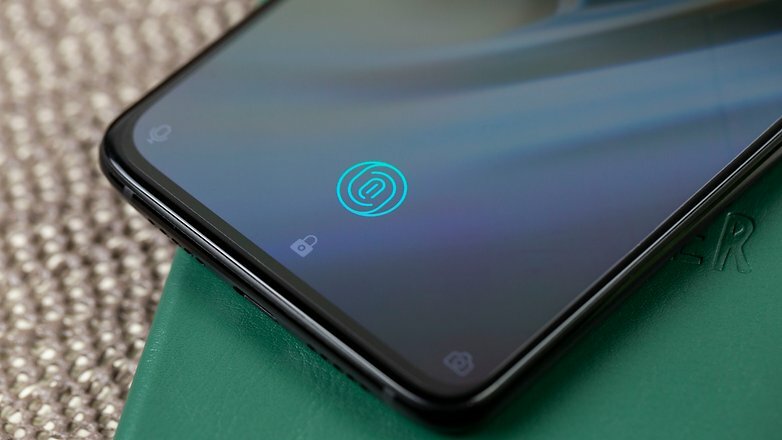 The implementation of the fingerprint sensor in the OnePlus 6T is interesting: a tiny camera sits behind the display and registers the biometric pattern of your finger optically. OnePlus actually wanted to integrate the fingerprint sensor into the display with the 5T a year ago, but there was no reliable and fast technology. When I asked why an ultrasound module was not used in the 6T, I was told that these modules did not yet meet the requirements of OnePlus at that time. Darling, you’ve shrunk the notch. It’s amazing that many manufacturers, including OnePlus, have compromised with the Notch to increase the display area, but now every manufacturer is trying to remove it or at least shrink it. It sounds simple, but it also requires that you have to reorganize the speaker, the front camera and the sensors for ambient light and proximity detection more cleverly in the tightest of spaces. 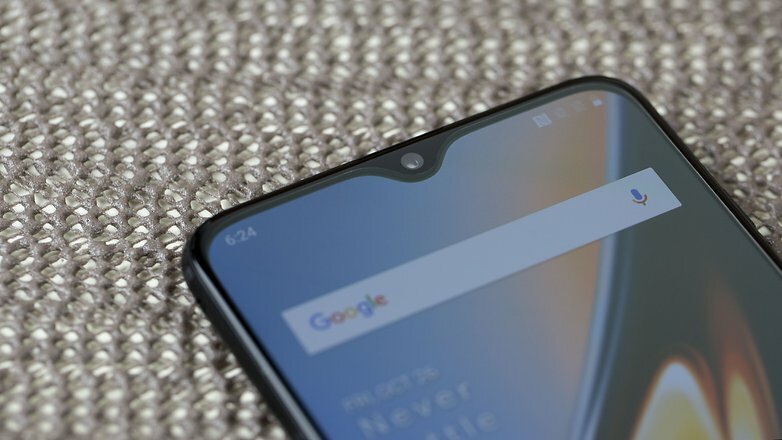 OnePlus, probably with the help of the parent company BBK suppliers and Co, has managed to shrink the notch to a minimum. 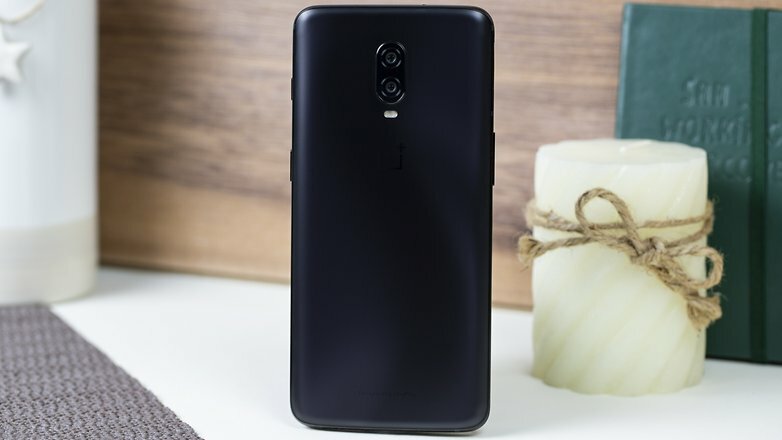 The dewdrop shape is clever because in the narrow blackened area to the left of the front camera, OnePlus was able to aesthetically accommodate the two necessary sensors including the notification LED. Incidentally, the AMOLED panel has grown and is now a 6.41-inch screen, thereby resolving 60 pixels higher than the OnePlus and it is now protected by Gorilla Glass 6. Due to the new fingerprint sensor and the display, OnePlus has also rearranged the internal components in the lower part of the smartphone. From the outside, this can be seen very clearly from the omission of the headphone jack. The space was needed to accommodate the components for the new fingerprint sensor. Even if OnePlus works using a so-called “stack”-construction to save space, more was still needed. Personally, I think it’s a good step because I haven’t used cable headphones with my smartphone for more than two years. 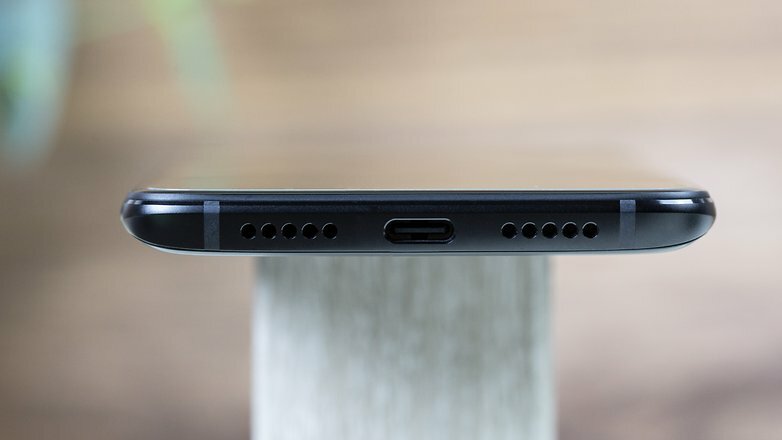 According to a separate OnePlus study, 80 percent of the community in 2017 was still convinced of the need for a headphone jack, but now the figure is just under 60 percent. Those who still prefer cable headphones would have to go for the new USB type-C earbuds, which come with their own DAC from Cirrus Logic and will cost around 20 euros in Europe, or 20 dollars in the US. For longer smartphone fun, OnePlus has given the 6T a larger battery. Instead of 3,300 mAh, the new one now holds 3,700 mAh and can still be rapidly charged with its own fast charging technology, identical to that of OPPO’s VOOC. Although the Super VOOC, introduced on the OPPO Find X Lamborghini Edition, is not available. When it comes to the camera, the hardware we know from the OnePlus 6 remains the same. Instead, OnePlus has focused on improving the software. In addition to improvements in portrait mode, where there were slight problems with sharpness in the past, a night mode called Nightscape was also included, according to OnePlus. At the time of writing this hands-on review, the software has not yet reached its final state. Unfortunately, we cannot yet evaluate how well the software optimizations work with low light at the current time. We can already say, however, that these optimizations will also come to the OnePlus 6. All in all, the small changes to the OnePlus 6T have the potential to create meaningful added value over its predecessor. We will know how great the added value truly is when we receive our review device and test it extensively. A larger display, a new fingerprint sensor, longer battery life and don’t forget the optimized camera software. With the OnePlus 6T, OnePlus is delivering product maintenance or rather product optimization. Because of the care and optimization, the price has risen a bit, which is justified from my point of view. Yet, in my opinion, anyone who already owns the OnePlus 6 does not have to upgrade to the T-model. The OnePlus 6T is more worthwhile for fans with a OnePlus 3 or 3T that are ready to buy a new smartphone.